Almost stood up and charged out of the theater on more occasions than I care to recall. 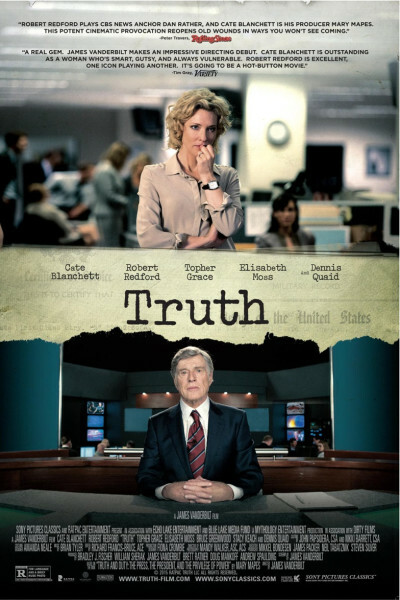 Redford is fine, but the rest, especially Cate Blanchett, are nails on a chalkboard. The movie is so heavy-handed, so leftward leaning, so agenda-driven, so propagandist, so message-y that it's shrill. Or drivel. Take your pick. It feels dishonest, underhanded, like it's trying to dupe or manipulate. There are so many false notes that I found myself twitching. The earnest scenes, designed to invoke tears, felt instead like pandering. It's clear that CBS made a mistake, and Rather and Mapes have axes to grind—and they are afforded two whole hours to do so here. If only the film had been more objective, more accurate; heck, if only the starring actress had shifted her schedule around to accommodate filming in Dallas rather than Australia in an attempt to make the film feel real. If, if, if. As it is, the film feels over-dramatized, hyperbolic, and revolves around an unlikeable and defensive core character, enrobed in soaring rhetoric and overstated truths. Shaky and claws sprung all the time. For the record, Mapes got a raw deal. Run out of town on the rails. Those around her failed her, and she was abandoned, scapegoated, castigated, banished. And yes, duh, journalism is dying and being usurped by infotainment. Too bad the film didn't capture this more effectively, more convincingly, more profoundly, and in a Paper Chase or The Insider or All the President's Men or Spotlight caliber way. It could have been a clarion call, a rallying cry, a movement movie. The sort that inspires a generation to become journalists, in the same way The Martian inspires one to become a scientist. My disappointment, my frustration probably originates here. From a 'dropped completion' point of view. I had hoped for more, so much more and, instead, simply got a wobbly soap box upon which character after character stand and scream, rather than cajole and convince using critical thinking and what was so handily at their disposal: the actual truth. Whoops, they did it again. First in their coverage on 60 Minutes, and again just now. In short, the film is a series of infuriating exaggerations, strung together, and that's my truth.